The Hot Toys DX Joker Collectible Figure has been very well-received since its launch in 2009. 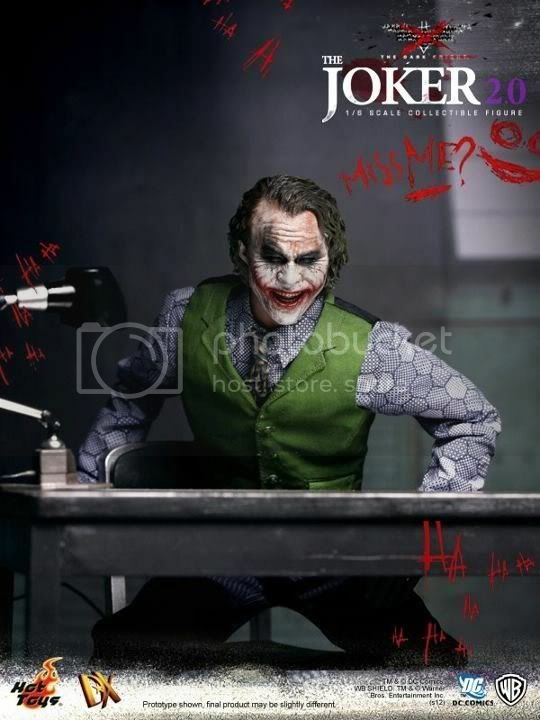 In view of fans’ expectation, Hot Toys is proud to present his advanced version – The DX Joker 2.0 Collectible Figure from The Dark Knight movie, specially crafted based on the image of Heath Ledger as The Joker in the movie, highlighting the highly detailed head sculpts crafted with the latest sculpting and painting technique by our chief Korean artists Yulli & JC. Hong and the costume customized by the extraordinaire 1/6th scale figure costume artist Kato, which best fits his advanced body. The Joker 2.0 is definitely a must-have for fans! The DX Joker 2.0 Collectible Figure is truly movie-accurate, equipped with our patented Parallel Eyeball Rolling System (PERS), highly detailed accessories and weapons. Last edited by DiFabio; 06-22-2012 at 01:03 PM. Last edited by batfan08; 06-23-2012 at 12:15 PM. Beat me to it, this ones my favorite. 2 heads! Wow..................... I'm a happy panda now. Last edited by DiFabio; 06-22-2012 at 12:20 AM. kato clothing, 2 heads, real shoes, better in every way. The laughing sculpts just as good as Adam's thank god I didn't blow 2 grand on a custom Joker or I'd feel like a real derp. So we did get a smiling head. "SPARTANS! WHAT IS YOUR PROFESSION?." By Butters in forum Aliens & Robots-Statues, props, kits, etc.